What an interesting year 2017 has been. I think we can all agree there’s rarely been a dull moment, a year where we needed one another more than ever. Yesterday I told a friend that Saturday’s first snowfall of the year was the best day of the year for me, it was all about simple pleasures. The cabin was at its coziest as I enjoyed a closed road, softly falling snow, rattled pots and pans in the kitchen and enjoyed my favorite holiday movie, Prancer. As I look back on the past year, I’m thankful for our music family for helping me sustain sanity in this insane world. You supported 18 performances with favorites like Ari Hest and Chrissi Poland, Jesse Terry, Denise Reis and Craig Bickhardt; and you heard Johnny Irion—he and Sarah Lee Guthrie will be back! Your generosity contributed to the livelihoods of 33 artists. Your faith in my curating skills allowed me to introduce you to new artists--Sofia Talvik, Shawna Caspi, Jeremy Aaron, Matt Bednarsky, Ryanhood, Teddy Kumpel. Jim and Sam began a new tradition with their delightful New Year’s Day concert. Every show this year had a least one first-time guest, our Facebook page grew by almost 100 likes this year, and we’re closing in on 1,000 likes! 2018 promises more of the same—a mix of favorites, a couple of “names,” and several emerging artists I’m excited to introduce to our gourmet audience. May this holiday season fills you with joy…you can find it in the simplest of ways and sometimes in the most unlikely places. Keep your heart and mind open, smile at strangers, give plenty of hugs, and we’ll let music sustain us through 2018. We're a 2016 Host of the Year! DRUMROLL, PLEASE! 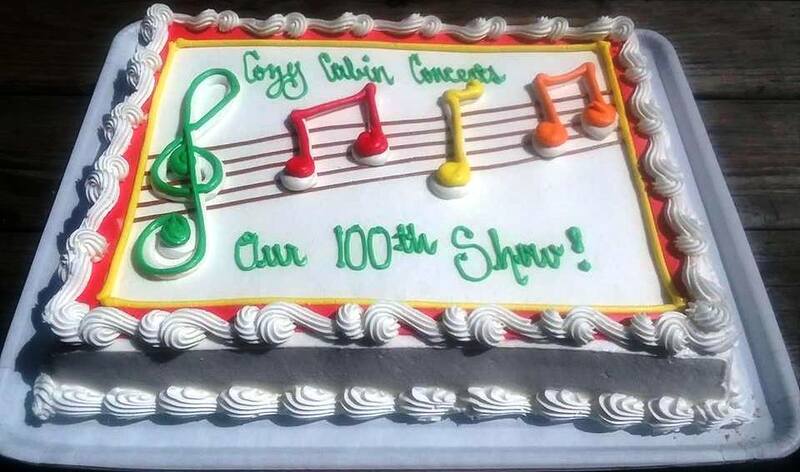 Cozy Cabin Concerts is pleased to announce they have been chosen as one of ten 2016 Concerts in Your Home Hosts of the Year by CIYH artists! -We love music so much that we've made it a hobby. -We love artists so much that we're taking them into our home and making them feel like family. -We care about our friends and community so much that we work to connect them with inspiring independent music. Ken and I were reminiscing earlier this evening about the last twelve months: 17 shows, 150 new Facebook page likes (over 850!) over 300 guests, all in our cozy cabin. Which show was your favorite? Were you here when Rushad Eggleston played the cello while perched on the fence, or when Mieka Pauley sang while her twin babies listened? Perhaps you enjoyed Christine Spero's Laura Nyro tribute show. Who was your favorite musical discovery? We certainly had plenty to choose from! We also remarked, as we often do, that we never imagined we'd be presenting concerts in our living room. Robinson Treacher, who was here with Brad Cole in August, said it wasn't too small at all, "Think of the three bears' chairs!" he exclaimed. "It's just right." You, our gourmet audience, contributed to the livelihoods of 36 artists through your donations and merchandise purchases. We love introducing you to talented artists whose favorite part of their job is performing for intimate audiences throughout the US and abroad. They've told me many times, without us (an audience to perform for), there's no them. 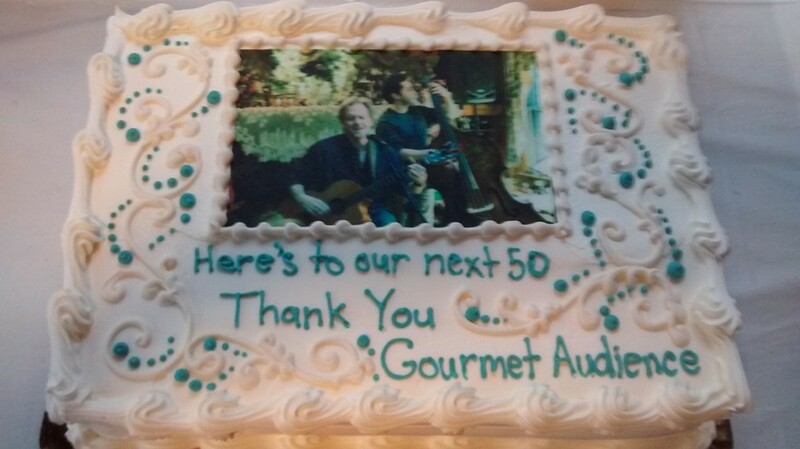 As always, thank you for your support of live music and the artists who make the sounds; they truly appreciate our gourmet audience! We look forward to sharing another eclectic year of music discovery with you. 2017 is certain to be interesting and challenging, and, as you know, music therapy is a wonderful panacea. Wishing you a 2017 that brings far more joy than sorrow, success however you define it, much good health, and peace of mind. ​Yesterday I learned that Music at the Mission, a North Jersey acoustic venue, had closed its doors after thirteen years, in part, due to the embarrassment of musical riches in and around New Jersey. MATM has hosted familiar artists like Janis Ian, Chris Smither and Roger McGuinn, but competing for an audience with at least a half dozen other Garden State venues on a Saturday night took its toll; their retooled program of local artists and open mic nights wouldn’t keep the lights on. 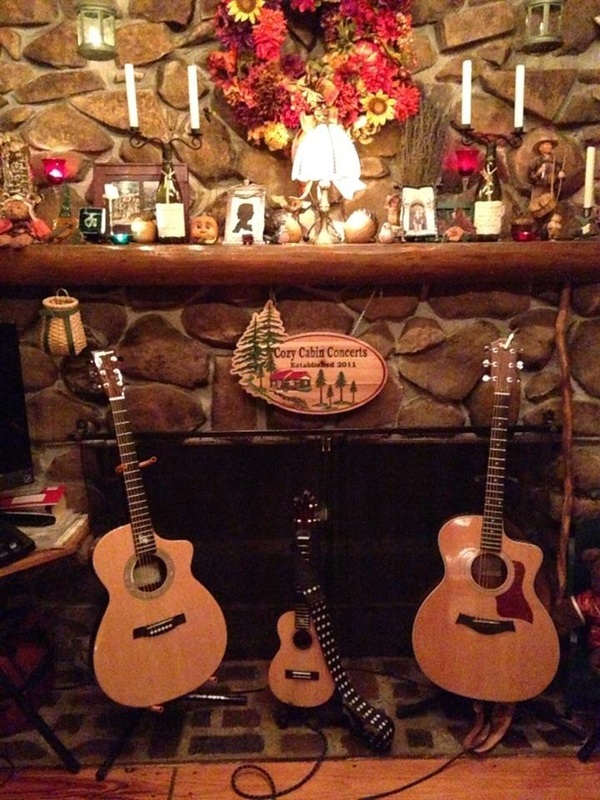 At the same time I learned of the closing, facebook reminded me that Caleb Hawley performed in our living room, our first Cozy Cabin Concert, August 13, 2011. James Maddock was going to perform a house concert in November as part of my birthday celebration, and we thought Caleb would make a great crash test dummy. Our friend Ernie flew in from California, we filled the room with everyone we knew, and their friends. Caleb left with more money than he came with, our friends had fun, and we know we could pull off our show with James. But we didn’t know this would be the spark to light the flame of my middle-aged passion. By now we were regularly attending local house concerts in addition to our regular church and rented hall venues. 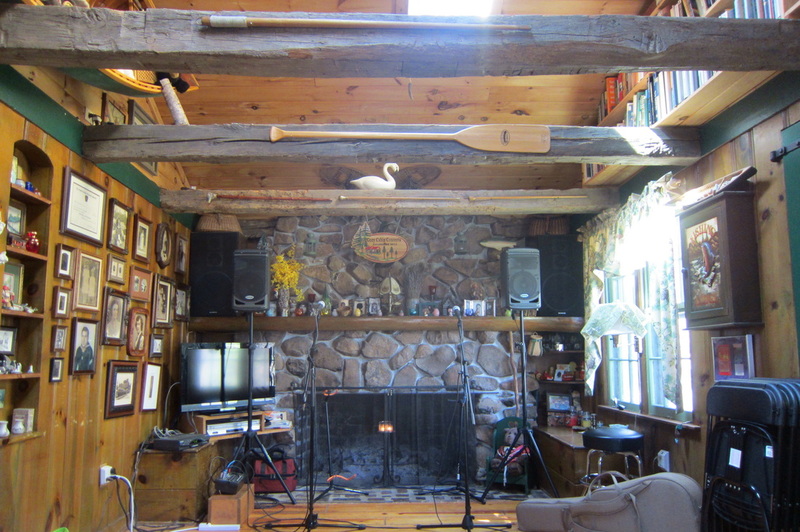 At one particularly off show—the lighting, the inadequate room size, the temperature—I turned to Ken and said, “You know we can do better than this.” And Cozy Cabin Concerts was born. Since our first concert with Caleb we’ve hosted 62 shows, with seven remaining in 2016, and the 2017 schedule is set. We’ve introduced our audience to incredible indie talent, I’ve acquired many honorary “kids,” and friendships have been forged at our shows. A few artists have returned several times, others would love to play here again, but a show, sometimes two a month, is enough for our modest audience and Ken. Together we’ve helped artists earn a living and follow their dreams, and we’ve created a community. I have CDs scattered on the console and front and back seats of my car. I was in my friend’s car today and she has a similar CD infestation. I checked out the titles, and every CD was an artist she discovered at the Cozy Cabin. 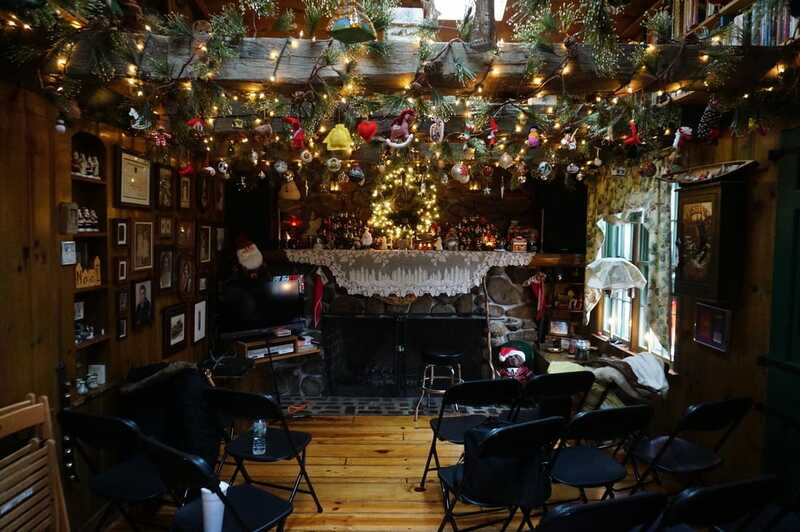 Another friend just called me to say they attended a show with one of our “kids,” who exclaimed, “I love playing there!” An artist friend has encouraged me to go big, perhaps collaborate with another presenter in a larger space to attract a larger audience, but I told him if I did that, it wouldn’t be Cozy Cabin. To paraphrase a favorite line from the film Bridget Jones’s Diary, I like it just as it is. 19 Shows, 24 Artists, Over 300 Guests = One Heck of a Year of Live Music! I’ve said it many times—we have the best audience of live music lovers. Together we’ve contributed to the livelihoods of 24 musicians by attending their shows, purchasing their CDs, and spreading the word about our favorite discoveries. In 2015 we hosted local NJ singer-songwriters as well as artists from Philadelphia and its environs, the New York area, New Orleans, Oregon, Santa Fe, Brazil, Japan and the UK! 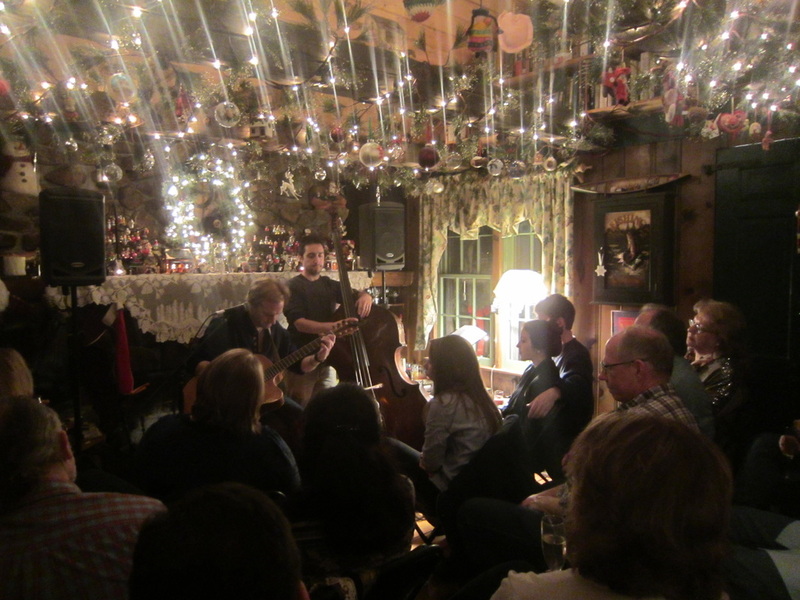 Nearly each of our 2015 shows had at least one “newbie” who discovered the joys of intimate house concerts. I love the community we’ve created in our living room, the friendships made, and the music we’ve discovered together. Our Facebook page now has over 700 “likes!” AND we reached a significant milestone at year-end--51 shows since our first show with our friend Bob Kasper opening for Caleb Hawley in August 2011! Thanks to your support, we’ll continue through 2016 with another eclectic year of music from neo-soul to Americana to blues to folk rock. Nearly all of our 13 performers are making their Cozy Cabin debut, most from the tri-state area, others from upstate New York, still another from Seattle, and I’m very excited to introduce them all to you. Whether you’re a super fan or joining us for the first time, THANK YOU for your support of live music and the people who make the sounds, and thank you for helping to make Cozy Cabin a must stop for many touring musicians. Without you, there simply would be no Cozy Cabin. Two weeks ago I had two back-to-back club nights in New York. In addition to the show ticket (which ranges from $10 to $25 depending on performer), there are drink minimums. One venue had a $10 minimum per show, the other had a two-item minimum. My friend and I joked that one glass of wine cost as much as two bottles, but that's the price of doing business. This was nothing compared to other friends, who spend HUNDREDS running up a drink tab if the night is going extremely well. While it doesn't come anywhere near a night out in New York City, we still feel guilty requesting a $20/$25 person donation and a pot luck dish to share, even though we provide wine, beer, and soft drinks, which some of my fellow house concert hosts refuse to offer because they don't want to deal with potential liability issues and spilled red wine on the carpet (I told those hosts if I worried about stuff like that, I wouldn't be hosting house concerts. And I'm the only person spilling anything at shows, and there are no carpets, just hardwood floors that warm the sounds musicians make). So why is it so difficult to get people to get off their sofas and out of their recliners to come out and hear an intimate live music performance? I'm not the only host with this problem; it's the number one fear of many a house concert/live music venue presenter. I know of two shows that were canceled this spring because of lack of interest. While one venue shutters, it seems two more open--coffee houses turn into listening rooms in the evenings, and I know of at least six house concert venues within an hour's drive from my house., but it's still a challenge to fill seats. A friend and Cozy Cabin semi-regular brought a guest to one show and they seemed to have a blast. But when the friend asked the guest why they haven't returned, they said $20 PLUS bringing food is expensive. Gotta tell you, dear reader, I was stunned. Fellow house concert promoters bringing nationally recognized names to their living rooms are charging $25 , $30 or more for the pleasure of hearing the artist in an intimate (up to 75 guests)., up close and personal space, and it's BYOB plus a dish to share. Venues like City Winery in New York have gotten clever and have created VIP tickets for artist meet and greets, adding $25 or more to a ticket. 2014 ends on a very high note at the Cabin. Rupert Wates performed two--two! sold out shows on December 28 to 50 guests and gave us the highest praise in by saying "the audience here is one of the most attentive I've ever played for. This is a gig to which every serious musician wants to return again and again." We hosted 18 performances for 350 guests, Our facebook page received seven "likes" in the past week, bringing us over the 500 mark. Our mailing list keeps growing, and artist inquiries continue to come in at an average of two a week. Friendships have been forged in our living room and on our summer stage (the deck), and more and more people are preferring intimate venues over the bar scene or arena shows. Apparently we're doing everything right, and plan to bring our gourmet audience more of the same in already-booked 2015. 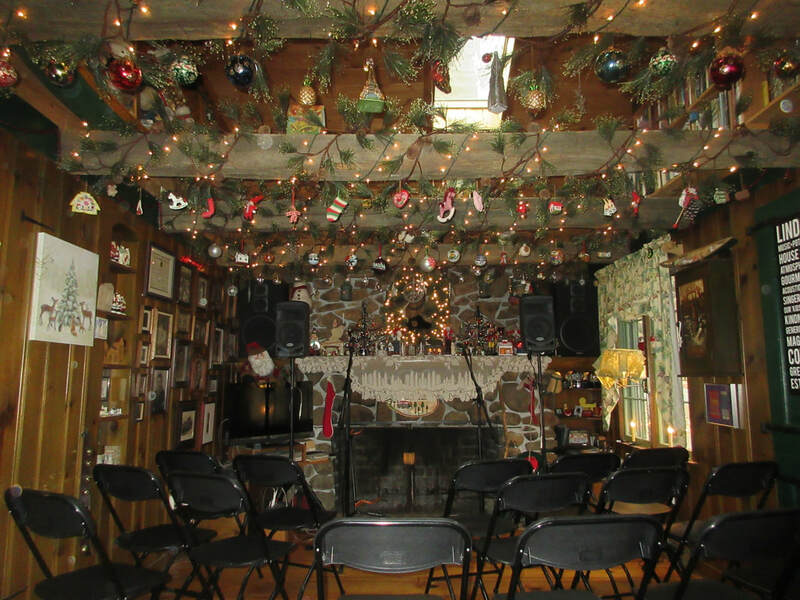 Most of the artists will be performing at Cozy Cabin for the first time, and every show will be a unique musical adventure. While we set the scene and light the lights, it's you, our audience of fellow music lovers, who are the reason for our success. I'll sign off with this rendition of a song Rupert and the audience sang in memory of Joe Cocker. Co-host Ken has always said Rupert so reminds him of Kenny. Here's to a kind and gentle 2015. We'll all get by with a little help from our friends. Last weekend we had a terrific co-bill with NYC’s Joe Marson and South Jersey girl Ginger Coyle. Among 21 paying guests, 14 were Cozy Cabin first timers. Since both artists had fans in the audience, I asked Ginger and Joe if they would be willing to do a “song swap” so their fans wouldn’t have to wait 45 minutes to hear their artist. Thankfully, both were willing to go with the flow and we were treated to an incredible evening of collaboration. Ginger said in a facebook post, “We were essentially strangers--two artists who had never met. Thanks to our open minds we created beautiful & spontaneous moments.” I’m fond of saying Cozy Cabin performances aren’t like a club experience—the environment, the vibe, the audience all come together to make each show unique; this show unfolded naturally and easily, and, while I claim that every show is my favorite, this one was truly special for reasons beyond music and camaraderie. Like many house concert venues, we have more artists who want to play in our living room than we have audience members, and we pushed the envelope by hosting three shows in September. Since I walk to the beat of my own drum, I didn’t realize that September was a busy month for many as people prepared for back to school, said goodbye to summer, and embraced the beginning of football season. I’m not attuned to the school calendar, I don’t follow football, and autumn’s been my favorite season since I was a child, so I was thrown for a loop when two of the shows had less than 10 guests. It was OK for the first artist—this was his first US tour and he was prepared to go with the flow, but second show was a co-bill with two emerging artists with a healthy following in Philadelphia. I was excited to introduce them to our NY area audience, and they essentially played for my husband and me. Artists take it in stride—a gig is a gig, but, as anyone who hosts a house concert knows, it’s an investment of time and money whether it’s three or 30 or more guests. I commiserate with other presenters all the time. We’re constantly expanding our emailing lists so we don’t create “audience fatigue” for our loyal regulars. I introduce Cozy Cabin every chance I get—I’ve invited fellow patrons sitting beside me at theaters, heck, I even invited the woman sharing my seat on a bus tour, and she happily came to that afternoon’s concert! It’s not just house concert presenters struggling for an audience. There’s an embarrassment of musical riches in the metro NY region—several medium sized acoustic venues, small listening rooms, and lately businesses that are coffee houses by day are becoming open mic spaces at night. Even though one venue closed last season and another will close in 2015, and two venues I frequent are also having a hard time filling seats, it seems new spaces open up monthly in churches, borrowed space in art centers, and especially living rooms. Of course, people have lives beyond music—there are kids’ activities, family milestones to celebrate, and the lucky ones are enjoying traveling or their weekend homes. Most of our shows have a donation of just $20; if a single artist is doing one set, we request less, and on the rare occasions that we book a household name, we request $25. Most agree that $20 for two sets of music, plus food and drink, is a bargain for a night out, but it’s still difficult to ensure a sold out show every show.